● Premium nylon yarn provides excellent wear, crush resistance and durability. ● Polypropylene yarns provide strength and inherent resistance to fading and staining. ● Special comingled yarn colors hide surface stains. ● Blended colors in each mat complement the most popular interior colors. ● Matching continuous nylon velour edge can never unravel. ● 4 layers of backing: 1) Polypropylene mesh gives the tufted yarn its shape, 2) Extra heavy latex creates stiffness to help maintain mat shape, 3) Water-resistant layer to keep moisture from the original carpet, 4) Tractionbac composition rubber final layer has natural non-skid characteristics. ● Mats for vehicles without OE anchoring devices, are equipped with Lloyd’s proprietary anchor ing system. 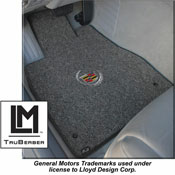 • Mats absolutely stay in place for the safe operation of the vehicle. ● Over 6000 unique floor designs. for Cars, Trucks, Vans and SUV’s, more custom patterns. ● Many one-piece full with width patterns for greater coverage. ● Licensed Trademark embroidered designs for General Motors, Ford Motor Co., Chrysler, Dodge, Jeep, Plymouth, and Porsche. ● Variety of thread colors. • Customers don’t have to “settle” for something they really don’t want. • Customers can create their own look.